So glad you're here for Day Two of Visions of Sugarplums! I've got a few Christmas goodies to share with you. 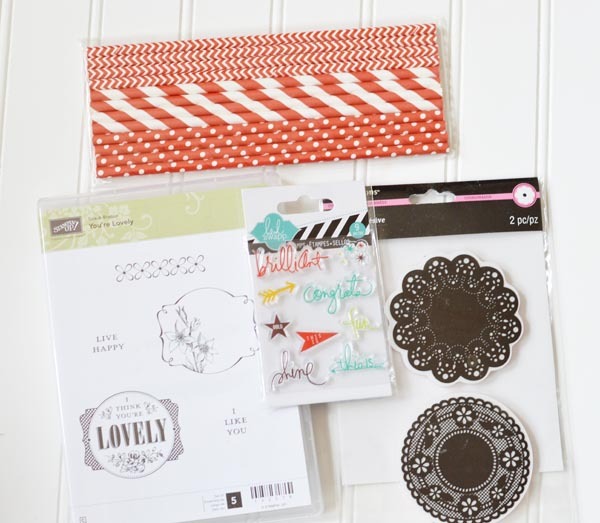 First off, I want to share a couple of things I made with images from Moonlighting by Mary. Mary has been so generous over the years to offer Visions of Sugarplums readers the chance to win one of her digital sets every day! My good friend, Jean, asked me to make her sister a set of Christmas cards and I'm calling them the Red, White and Gold collection. I used one of Mary's images to create the first one of the set. Hard to see in the photo, but I started by embossing the background. This beautiful image is a vintage postcard. You can find her HERE in Mary's store. I cut out the pretty little girl and cut out the sentiment to use separately. Next up is a banner. Mary has done all the hard work. 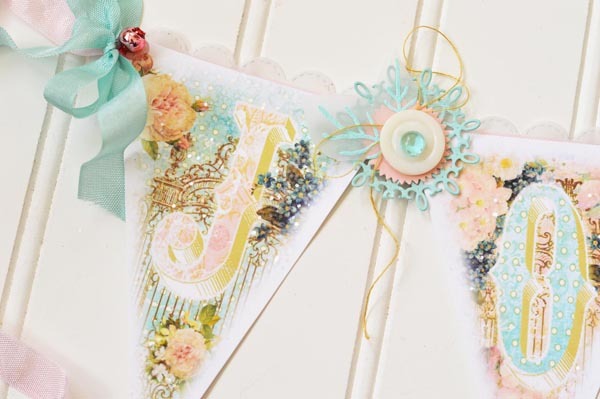 Look at the gorgeous pennants! All you have to do is print them out. You can find it HERE. The set also comes with very pretty angels. 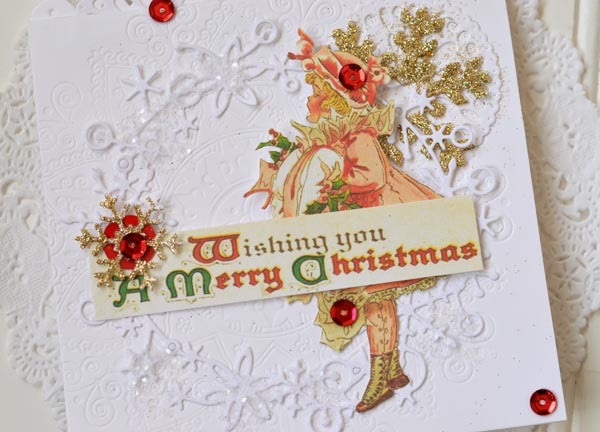 I added some glitter around the letters and die cut vellum into a scallop for the tops. Hard to see the glitter in these photos, but I love this! 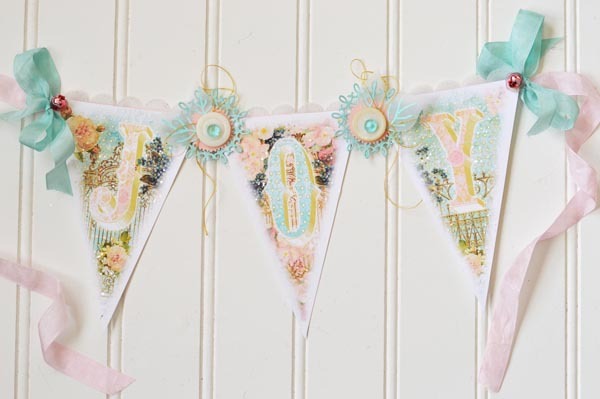 I have to say pink and aqua is one of my favorite combinations. 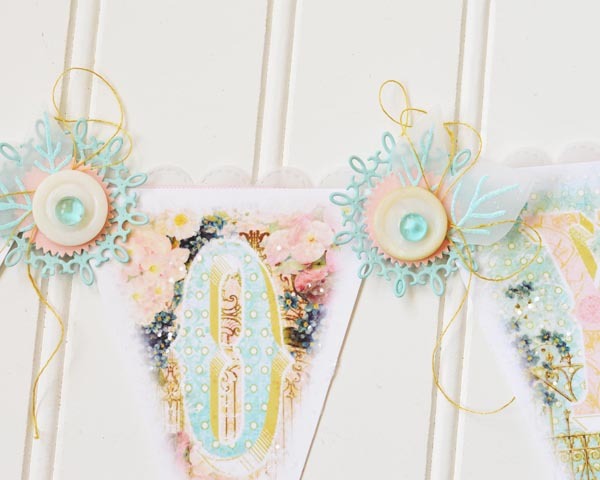 Someone who is new to Visions of Sugarplums is Heather from Vintage Bella. She has some cute and sweet vintage images. I especially love her art deco images. It's always fun to visit her store! 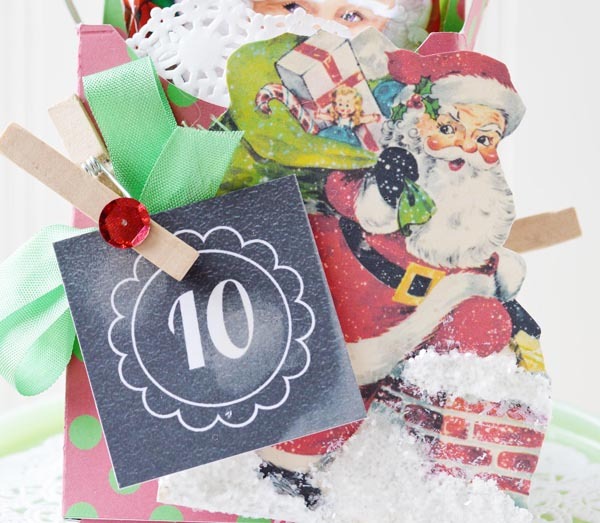 I used one of her Santa images to create a Christmas countdown. Now, I've done some complicated countdowns. I wanted this one to be EASY! I wanted it to be able to hold a small treat or note, but I did not want to make 24 different boxes. So I came up with one fun box and changing out the numbers on the box. And I've made it even easier by creating the countdown numbers for you. 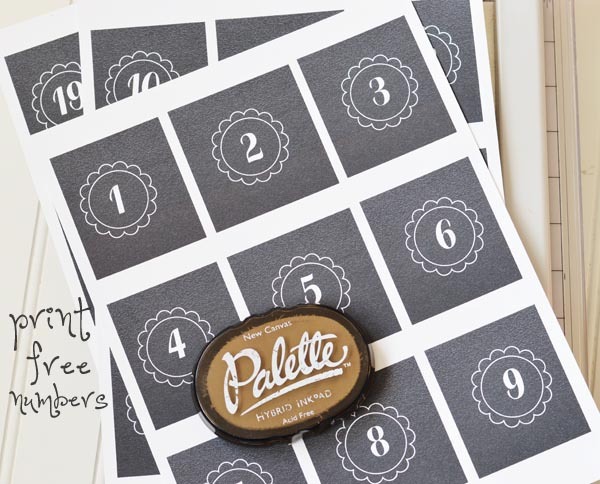 First, print out the free countdown downloads: HERE, HERE and HERE. Cut them into 2" squares. Make them look even more chalkboard-y by smudging white ink on them. I just use my fingers! Next print out your image. This Santa is part of the 1940s Santas set. I made him a little more fun with a little Snow-Tex and glitter. 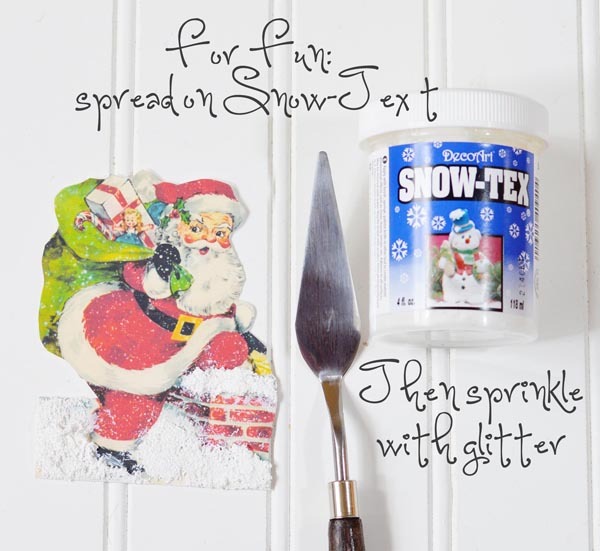 Let the Snow-Tex dry awhile before covering with glue and glitter. The box is called Cutesy Cover and it's a free download right HERE. 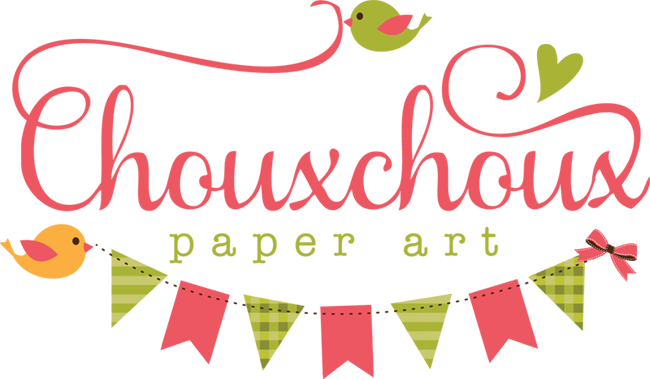 It's available for handcutting in a PDF or electronic cut files. Now you need a way to store the numbers, so they're not just loose floating around. Tie a bow around the box. Pop the numbers in a bag and clip them to the ribbon. These are some of my favorite shops! A big thank you to them for all the goodies! If you've won a Vision of Sugarplums giveaway, please email me at lhairston@cox.net. I'll get back with you and let you know how to claim your prize. Thank you! Can't wait to see what awesomeness they have in store for us! Did you see yesterday's inspiration? WOW! Come back tomorrow for Day Three of Visions of Sugarplums! Wow Lori, even more fabulous creations. That banner is lovely. The mega bundle is growing - what super giveaways. I would love to be in with a chance. OMGoodness, I won! Awesome, I'll be emailing! Thank you so much - and thank you to Studio ShineVintage! 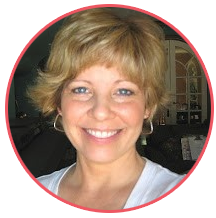 Your projects today are beautiful, Lori! I love the idea of the Christmas countdown, and the banner looks amazing! I checked out your sponsors' shops - what gorgeous images over there! And, yes, I would love to win your prize! WOW! I can't believe I won! Thank you so much. Just sent you an e-mail. I Love your projects! They are all so amazing and I'm on inspiration overload! Need to get my CHA stuff done quick so I can make some of these goodies. Your hops are always so much fun. oh and yes I would love a chance to win! Hi. Regina sent me. Beautiful art you have made. I like the frills. Thank you for the hop and chance to win. Your makes are so gorgeous Lori and I want you to know how much I appreciate you doing this. Really some wonderful projects -- I need more time!! I figured it out Lori!! YIPPEE!! I have to use Internet Explorer instead of Google Chrome to be able to post comments to your blog. I had the same problem with Mitra's blog tonight, so I did some internet searching for a solution!! Your projects are absolutely WONDERFUL!!! Jean's sister is blessed to have you make her a set of cards because I LOVE the one you showed us from the set!! The banner is SO PRETTY too!! Mary's images are so vintage and gorgeous!! 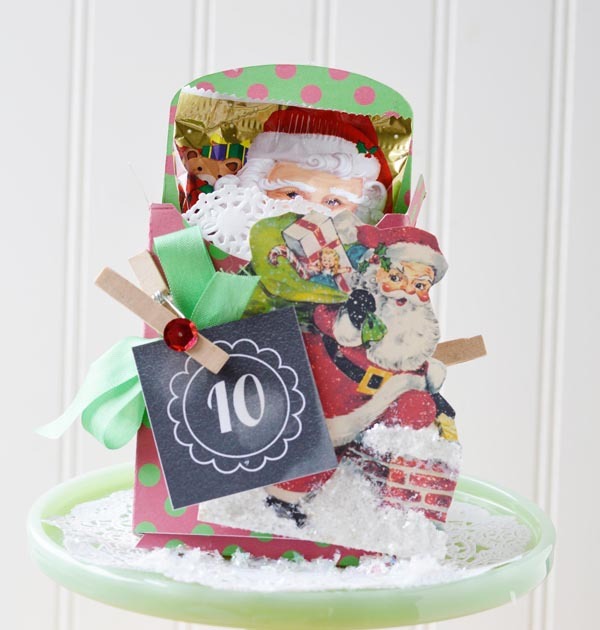 Really cute box you created for the Christmas countdown, I love how you decorated the image with the Snow-Tex. I think I have something like that around here. 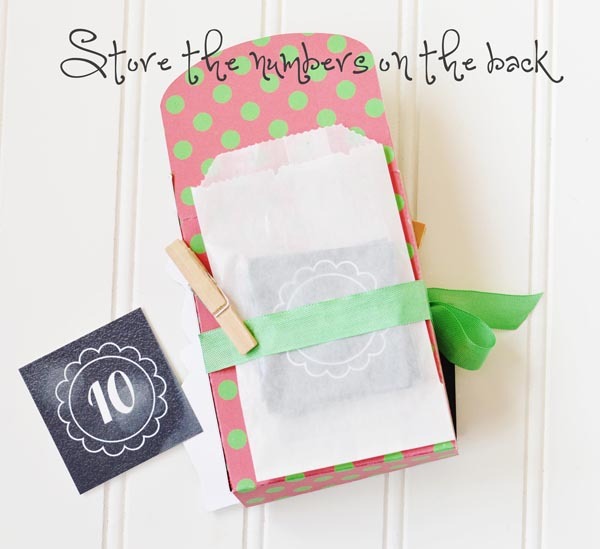 Great idea to have the numbers stored in a bag in the back too. Thank you SO MUCH for choosing my name to win a prize and to Moonlighting by Mary for her generosity!! Day two is TERRIFIC!! All the shops are wonderful. The Cameo Shoppe would be my next choice. Thank you so much for this opportunity and for the free downloads! your projects are absolutely stunning... your creativity astounds me!